For two weeks classroom teachers, education professionals, administrators and artists were immersed into a variety of art forms including book arts, creative movement, music, printmaking, storytelling, theater, mixed media and writing. Led by professional arts instructors, the Artist/Teacher Institute (aTi) participants broke through barriers to creative teaching and learning and connected with a community of peers, emerging refreshed, renewed, energized and inspired. The article below was written by High School English Teacher Christine Salvatore-Smith about her aTi experience in poetry and book arts. Teacher gets the chance to bask in poetry and be challenged by book arts! High school English teacher, Christine Salvatore-Smith, often finds herself lagging in spirit and creativity by the end of the school year. When the summer comes, she has found just antidote for her woes. 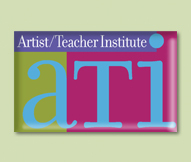 Instead of spending eight weeks lounging on the beach or fretting over new lesson plans, Ms. Salvatore-Smith attends aTi, a program for artist and teachers. There , she says, she finds the spark that will help her to teach better, lead better, and be a better person all around. Ms. Salvatore-Smith took Advanced Poetry Writing with local poet Peter E. Murphy as her three hour morning major and Book Arts with local artist Mary Phelon as her two hour minor in the afternoons. Salvatore-Smith explains her choices, “I’ve always written poetry and as a Creative Writing teacher, I think you have to write in order to teach. I come to aTi to work on my own writing but that’s not the only reason.” Salvatore-Smith goes on to say that the techniques she learned from Peter Murphy are techniques that she can translate into lesson plans for her Creative Writing students and even her AP Literature students, “He helps us generate ideas and then revise until our work is better. He’s full of tips and strategies that I can pass on to my students to help them write better. These strategies work; I know because I’ve tested them. See what other participants had to say about aTi and view some of the work produced this summer!